A record 99.9 percent of smartphones sold worldwide last year were based on either Android or iOS, as all competing platforms have effectively been squeezed out, according to data shared today by research firm Gartner. Android remains more widely adopted than iOS by a significant margin, with a roughly 86-14 percent split between the respective operating systems last year. Android's dominance is unsurprising given the software is installed on dozens of different smartphone models offered at a range of price points, whereas the iPhone primarily caters to the high-end market. 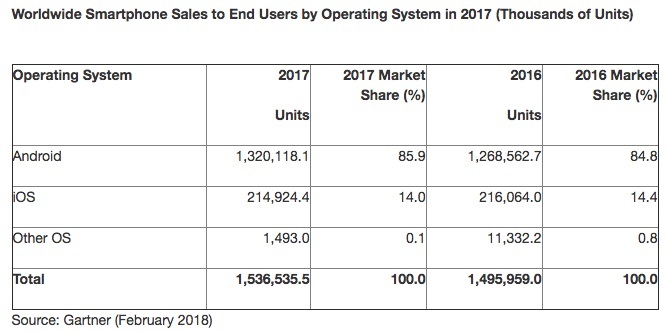 Android and iOS have been the leading mobile operating systems for many years now, but the duopoly became so dominant last year that Gartner doesn't even break out BlackBerry and Windows Phone individually anymore. Together, the platforms accounted for less than 0.1 percent market share in 2017. For perspective, Gartner estimates that of the just over 1.5 billion smartphones sold worldwide last year, handsets running BlackBerry OS, Windows Mobile, and all other platforms made up only 1.5 million of the total. 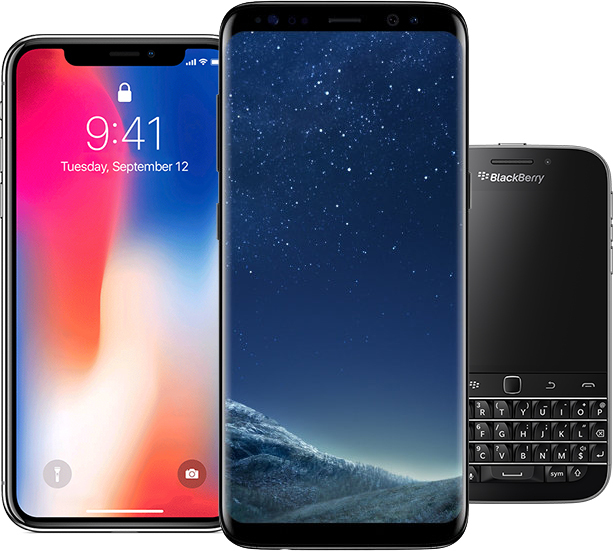 The writing has long been on the wall for BlackBerry and Windows Phone, which have been ceding market share to Apple and Google for the better part of the last decade. But with Android and iOS finally reaching 99.9 percent market share, it looks like the platforms will be officially dead soon enough. In the meantime, BlackBerry recently announced it will continue to support its BlackBerry 10 operating system for at least two more years, but it encourages customers to upgrade to its Android-based smartphones manufactured by TCL. BlackBerry World and other legacy services will shut down by the end of 2019. Back in October, Microsoft likewise announced that it will continue to support Windows 10 Mobile with security updates and bug fixes, but it will no longer develop new features or release any new Windows Phones. The fall of BlackBerry in particular is remarkable given it was the pioneer of the smartphone industry. Its devices actually continued to grow in popularity for around two years after the iPhone launched in June 2007, at the expense of then-leading Nokia, with a peak market share of around 20 percent in 2009. It only took a few years until the surging popularity of iPhones and Samsung Galaxy smartphones led iOS and Android to leapfrog BlackBerry and Nokia, and based on today's data, the duopoly is now firmly entrenched.